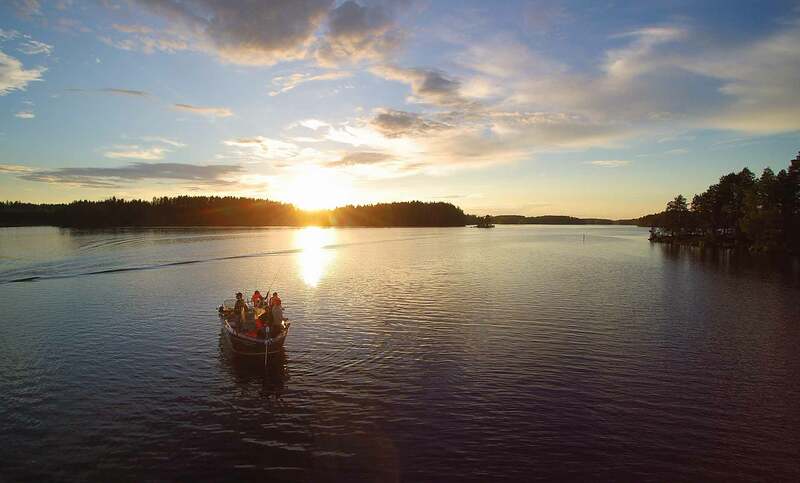 Pike is the favourite fish for Finnish fishermen. This predator fights strongly after striking the bait. There is no minimum length in catching pike but of course we follow the rules of responsible fishing. Therefore we release all the biggest individuals to guarantee a healthy and strong population in the future. Pikes are active all year round except during the short quiet period straight after the ice melts from the lake. The best time to catch the biggest specimen is in May and June and in autumn starting in September. In Finland pikes can grow up to 13 kilos. Pike can be catch by spinning, jigging and trolling. Read more about the Big pike fishing trip. 1. Choose a lake with lots of breams and roach, for example lake Soukkio or Härkäjärvi. Pikes are predators and need much food. Especially breams like to stay in the shallow and grassy parts of the lakes, and the hungry pikes follow. This equation means that many small, shallow lakes are excellent for pike fishing. A fishing kayak is very handy for moving around and spinning from in these shallow fishing waters. 2. Be quiet and move silently. For moving on smaller lakes or on limited area, rowing and electrical motors are to prefer. 3. Be very patient. It might take tens of throws before a pike decides to strike. Throw always many times on the same spot before trying another. Keep also on eye on the water surface. If you see a big fish moving under the surface, throw immediately to that spot. Sometimes this very tasty fish can be moody and agressive and within one night it changes its place and likings. They normally live in groups so it is possible to catch more at the same place. You can catch it with jigging and trolling. Both styles are very effective. The best season to catch them is from early June to end of September. In the warm nights in midsummer the zander can follow the baits fishes near the surface. This enables to catch zander by trolling in a very beautiful landscape under the sun set. Zander should have a minimum length of 45cm at lake Kyyvesi. The biggest individuals should also be released to secure the healthy and strong population for the future. This little but aggressive fish might surprise you at the fishing trip. Perches live in groups and when founding the group chasing for little fishes you will get a fish with every throw. 500g-1kg is not unusual to catch so fishing for perch can be as adventurous as fishing for bigger predators. The fish meat tastes delicious and it is recommended to prepare an exellent lunch from it afterwards. You can fish it all year round (yes, also in winter) but the open water season in August and September is the best. We suggest to catch perch by jigging or spinning but trolling is possible as well. Probably the most beautiful fish in Finland is salmon or trout. But it is definitely the hardest catch to get. Quite often you might go home with empty hands but when you finally get the salmon on your hook the experience will be memorable. Although the wild salmon and trout are endangered there is some left in lake Puula. Nowadays there are certain restrictions in salmon fishing. When fishing at lake Puula minimum length for salmon is 60cm and 50cm for stocked trout that has cut adipose fin (fishes with adipose fin must be released). Trout with original adipose fin is totally protected and it is against the law to kill it.